Furfuryl Alcohol Drives the Global Demand Growth for Furfural to Reach 455k Metric Tons by 2024 – Market Report (2018-2024) by Industry Experts, Inc.
Industry Experts, Inc. introduced the global market report on Furfural. The new and an exclusive market research report entitled ” Furfural and Furfuryl Alcohol – A Global Market Overview ” reveals that the Furfuryl alcohol constitutes the largest application segment for furfural and the trend is likely to continue in the future. This is substantiated by the fact that over the 2018-2024 forecast period, demand for furfural in the production of furfuryl alcohol is anticipated to maintain a faster growth than other applications. Furfural, also widely known as furfuraldehyde or 2-furaldehyde, is a clear, colorless motile liquid with an aromatic odor reminiscent of almonds. Furfural is produced from agricultural waste biomass, such as corn cobs, sugar cane bagasse, rice and oat hulls, and wood chips, which contain pentosans (xylan, arabinan and polyuronids), the complex carbohydrates contained in the cellulose of plant tissues. Furfural applications analyzed in the study include furfuryl alcohol, solvent applications, pharmaceuticals and others (includes flavoring agent, chemical intermediate and agriculture). The global market report reviews, analyses and projects the Furfural and Furfuryl Alcohol market for global and the regional markets including the North America, Europe, Asia-Pacific, South America and Rest of World for the period 2015-2024 in terms of volume (metric tons) as well as value (USD). The regional markets further analyzed for 20 independent countries across North America – the United States, Canada and Mexico; Europe – Belgium, France, Germany, Italy, Russia, Spain and the United Kingdom; Asia-Pacific – China, India, Japan, South Korea and Thailand; South America – Argentina and Brazil; Rest of World – Iran, Saudi Arabia and South Africa. The Furfuryl Alcohol regional markets analyzed for 17 independent countries across North America – the United States, Canada and Mexico; Europe – Germany, Italy, Russia, Spain and the United Kingdom; Asia-Pacific – China, India, Japan, South Korea and Thailand; South America – Argentina, Brazil and Chile; and Rest of World – Turkey. 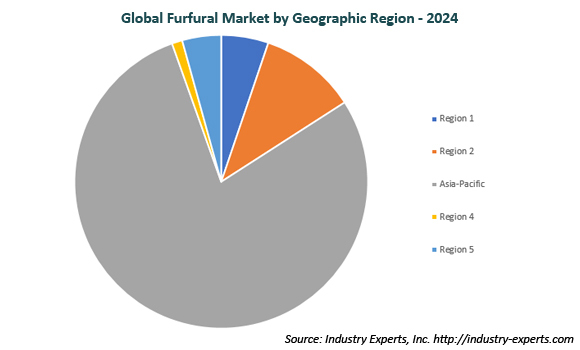 This 274 page global furfural and furfuryl alcohol market report includes 223 charts (includes a data table and graphical representation for each table), supported with a meaningful and easy to understand graphical presentation, of the market. This report profiles 10 key global players and 25 major players across the North America – 2; Europe – 6; Asia-Pacific – 12; South America – 2; and Rest of World – 3. The report also provides the listing of the companies engaged in research & development, manufacturing and supply of furfural and furfuryl alcohol. The global list of companies covers addresses, contact numbers and the website addresses of 96 companies.